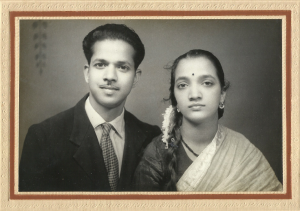 A long time ago, there was a beautiful young girl who came to Pune from her native place in South India. She fell in love with a handsome guy and married him. They were polar opposites. She was strong, independent, a control freak and extremely practical. He was an artist by heart, very impulsive and stubborn. After they had three children, he suddenly lost his job, and never recovered financially. He tried several business ventures, none of which succeeded. Debts kept mounting, and creditors’ unwelcome visits became a norm. She braved all these circumstances and kept fighting. Along with her extremely demanding nursing profession and intercity transfers, she kept on doing various side businesses. She sold saris and dress materials. She sold imitation jewelry. She sold sweaters and shawls. She helped sell TVs and appliances. She clawed her way out of all debts, single handed. She made sure all her children got the education they needed and wanted. During all these struggles, diabetes got hold of her. The constant financial pressures and the stresses of living in a slum-like area did not help either. She had multiple close calls, but survived each of them. Her husband meanwhile sustained a serious head injury in an accident and never recovered. After her children had settled down in their careers, and the family shifted to their own house in a better area, it was time for her to retire. But then began the rapid decline in her eyesight. She never even wore spectacles till then, but her retina started giving way, and soon she lost her eyesight completely. Even after such a loss, she remained as optimistic and full of life as ever. Her sharp instincts and memory never failed her. She memorized hundreds of phone numbers (including cell phones), birth dates and anniversaries. Everyone in her relation, in her friend circle, in her children’s friend circle would get a call from her on their birthdays and /or anniversaries. 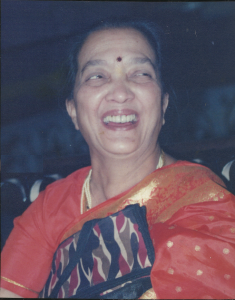 She had an amazing sense of managing her money, and loss of her eyesight never affected her instincts till the end. After her younger brother passed away last year, she called her children and made them promise her that they would support each other after she passed away. She never believed in any religious rituals and told her children not to indulge in any after her death. Soon after her brother’s death, during Diwali ‘2014, she broke her thigh bone and that was her last hospitalization. Her health declined rapidly over the next month and she passed away on 24th November, on the 10th birthday of her beloved grandson. Mom, I miss you so much! But whenever I remember you, it’s not sadness I feel. I feel your presence and protection around us. I remember how you used to worry when I came home from playground with fresh bruises every time. I remember how you always put on a brave front when there were creditors at our doorstep. I remember you sitting close to the TV set (clad in your “lucky sari”) and listening intently to the commentary when Indian cricket team would be playing a match. I remember how you had thrown a big party when Indian cricket team defeated Pakistan in the finals at Dakka, after our own Pune player Hrishikesh Kanitkar hit that historic boundary on the Saklain Mushtaque delivery! I remember your uncanny ability to spot exactly which of my female friends I had a crush on! I remember the excitement in your eyes when I explained the computer and internet to you for the first time! I remember the proud look in your eyes when we got the possession of our own apartment. I remember how you hugged me tightly and cried on my shoulder when I was about to board my first flight out of India. I remember your joy when your eyesight returned for a brief time after surgery and you saw your grandson’s face for the first time. I remember your proud feeling for us, when we adopted our baby girl and brought her home. I remember you talking to your younger sister on phone for hours (closing the door of your bedroom so you could have privacy), and then coming out of your room and telling me everything you and she had spoken about! I remember that fulfilled look on your face when the whole family gathered around you and we had those long nostalgic chats in the night over cups of tea. I remember how sharp were your memory and your wits till your last breath. I remember how strong and assuring you seemed even when you were hospitalized in your last ailment. I remember how peaceful you looked when you crossed over from this world. I remember how much rudderless I felt once the fact that you were no longer with me sunk in. I remember thousands of instances which make me feel your aura around me, and everyone in the family. You were the most influential person in my life, and will always be a part of my being. Wherever you are, let you be in peace. I had my rock of a Father for a couple more years. Sadly,6 months later I lost my 10 year old shihtzu. Grief is a strange lens to see the world 🌎 through. and a move later, letting our family home to too. I miss both my parents a lot, but feel them with me often. They say life goes on – it does, sometimes painfully. The world 🌎 is a great place (most of the time). And life does go on. My art has helped me a bunch. I am also self taught. This is when I feel both of my parents with me the most. “Follow Your Passion” is the biggest bull***t you ever heard! Ben Cryer on And the Doodle mania continues!